SCVHistory.com | Tataviam Culture | 'Loophole' Allows Desecration of Prehistoric Site, 2001. 'Loophole' Allows Desecration of Prehistoric Site. Signal Staff Writer | Thursday, November 22, 2001. 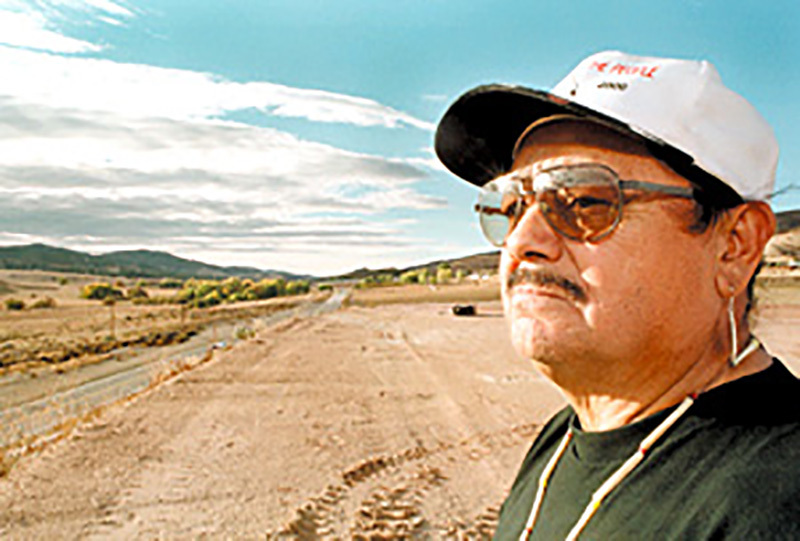 John Valenzuela, chairman of the Tribal Council of the San Fernando Band of Mission Indians in Santa Clarita, overlooks a construction site in the Leona Valley where prehistoric Native American artifacts have been disturbed. Photo: Eric Thayer/The Signal. A historical site on private land in Leona Valley was recently graded by the property owner, with numerous artifacts feared lost, after what one Native American group fears is an inexcusable oversight. The owner of the land, on Lake Elizabeth Road, applied for a permit to grade the land and one was granted, with the man removing about 15 feet of a ridgeline to make way for a structure. The site, recorded under federal registry, contained several Indian artifacts, said John Valenzuela, a chairman of the Tribal Council of the San Fernando Band of Mission Indians, which recently established its headquarters in Santa Clarita. Valenzuela is calling it an act of desecration, saying that the loss is inexcusable, with the county to blame. "What happened here is that somewhere along the line, somebody didn't go into the (South Central) Coastal Information Center to find out any information on this site," he said. He said that for large developments or projects, that kind of investigation is done, with the proper environmental documents that include historical and cultural discussion. "The county doesn't have it for a single-family home," he said. But Mark Pestrella, a principal engineer for the county Department of Public Works, said there was no oversight, and that it's up to the property owner to determine what they want to do with any artifacts. "The owner was in conformance with the law at the time when the permit was issued," Pestrella said. The issue sparks debate over what some call a loophole in state law that gives property owners ultimate power over their land, despite the historical significance it may have. "There are holes in CEQA (the California Environmental Quality Act) concerning the protection of sites," said Rob Wood, environmental specialist with the California Native American Heritage Commission. Pestrella said that, under the CEQA which sets up boundaries for development, county public works does not require disclosure for such grading and building permits on privately owned land. "There is no mandate requiring us to ask that question," he said. "It really comes down to the property owner." Wood said that in development, state law requires that studies be done, but the statute does not describe how. "It only says that they have to do a cultural impact report, but it's pretty silent on how it should be done," he said. He said disclosure, at least of historically significant items, is dependent on the property owner, and the smaller the project, the less CEQA has any clear description about how to deal with the matter. "If it is a larger project (CEQA has parameters) but in the case of a single-family residence, it's a gray area," Wood said. Valenzuela said that for this permit, not enough investigation was done into the site. He said that for large developments or projects, that kind of checking is done. Wood said he didn't have much experience in dealing with Los Angeles County, but that this incident occurs too frequently throughout the state. "Some counties are very sensitive to this kind of thing," he said, naming San Diego and San Luis Obispo counties as being diligent about Native American concerns. Valenzuela said he spoke with the owner of the property, and that the man told him he knew some remains had been found and removed, but that the county didn't let him know it was a historically registered site. But Valenzuela blames the county, not the owner, saying "someone should have caught this." CEQA documentation was done on the land during a city of Palmdale road realignment project for Lake Elizabeth Road. The land on the west side of the road is under county control, while the land on the east falls under the city of Palmdale. That report included investigation into human remains that were discovered in 1997 on the graded patch of land. State law requires that, when human remains of Native American descent are discovered, if the remains are to be moved, it must be under strict supervision by a Native American monitor. The moving of human remains is something that is usually best avoided, Wood said, but if it needs to be done, there is a very specific policy. "Spiritually, they should be avoided, but if that's not possible Native Americans help see that they are moved in a dignified manner," Wood said. Archaeologist Beth Padon, who worked with Valenzuela during the road realignment project, said the area in that canyon is "considered sensitive" when it comes to its Native American history. In fact, according to Padon and Valenzuela, the Lake Elizabeth Road project was altered because of the discovery of those remains. In addition, the items found in such an area are much more subtle, Padon said, because they consist of tools or the materials for making tools — a contrast to building foundations or other more recognizable items. "For prehistoric sites in our area, they don't have a lot of evidence of their village," she said. On this particular project, stone tools were discovered, and when more investigation was done, the human remains were found. Also found was a cairn, a particular placement of stones that indicates a burial ceremony took place. "There were a ton of artifacts," Valenzuela said. "There was a lot of stuff, beautiful stuff." While Padon said, "We didn't find any real datable material," she estimated that the artifacts were anywhere from 500 to 1,500 years old. Since only a small portion could be studied, the historical significance cannot be fully looked into, she said. "We only got part of the story," Padon said. She added that this particular discovery of human remains was particularly significant because it was among the first in the Antelope Valley area that had evidence of an actual burial ceremony. "Finding the human remains and the cairn increased the significance of the site," she said. "You just don't find that often." 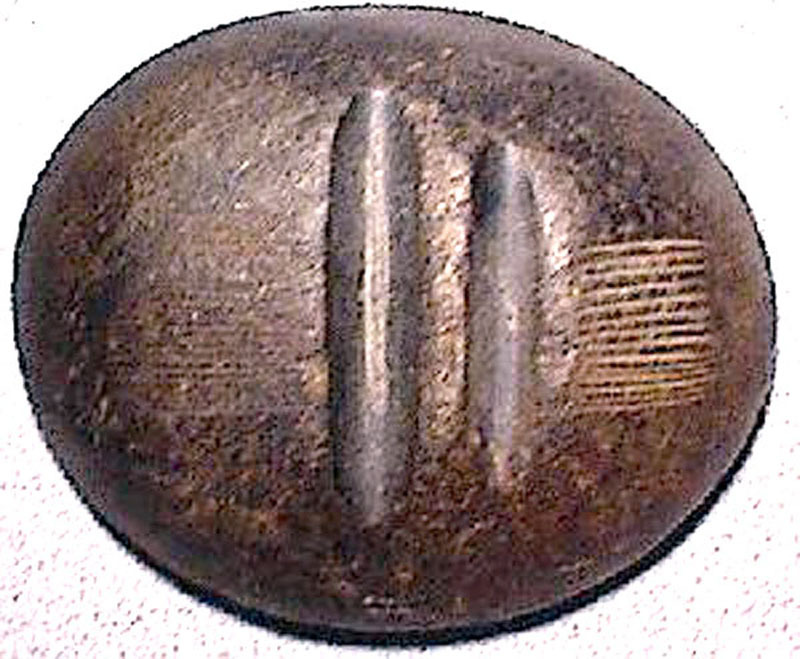 In this case, the person was buried with a large grinding stone placed on top of them. "This might have been a tool that the person used," she said. Those remains were moved, under supervision by Valenzuela, to a site just across the road. While Padon and Valenzuela were at the site, they also noticed numerous other items. Valenzuela said there are a number of sites through that particular canyon, which could have been seasonal trading sites where local tribes traded their goods with Native Americans from desert-region tribes. "All the way through here there are archaeological sites," he said. Valenzuela said no one knows what the graded area was, and that if large-scale development continues in that canyon without more study into the historical significance of the area, its significance could be lost forever. Margaret Lopez, of the South Central Coastal Information Center — which maintains archaeological site records for the state — said the graded area has never been given any in-depth investigation, and that the matter is still being looked into. As for the site in question, Valenzuela said the owner of the property offered to let him come in and look for artifacts, something Valenzuela hopes to do with the help of an archaeologist. But Valenzuela said the damage has already been done. "For us it's too late," he said. "This is a constant battle for the Indian people in California." He added, "These are the last vestiges of many thousands of years of a culture people are still trying to hold onto. But more and more, it is getting destroyed." The San Fernando Band of Mission Indians — whose members include descendants of the Tataviam, who arrived in the area that is now the Santa Clarita Valley more than 1,500 years ago — represents Native American families with roots in both the SCV and the Antelope Valley. Valenzuela said this should motivate all people, not just those of Native American descent, to pay more attention to the preservation of the history of the region. "We want people to know, they need to open their eyes," Valenzuela said. "If they continue this way there will be nothing left to show of our ancestors." ©2001 THE SIGNAL | USED BY PERMISSION | ALL RIGHTS RESERVED.